Last Thursday September 6th we officially opened our new webinar studio in the heart of corporate Netherlands: the central hall of the WTC Amsterdam. Company Webcast, part of Euronext NV, is the undisputed market leader in webinars and webcasts. With more than 10,000 broadcasts per year, five professional webinar studios in Paris, Brussels, Rotterdam, The Hague and Amsterdam and its Next Generation Webinar Platform, Company Webcast sets the new standard in professional webinars worldwide. 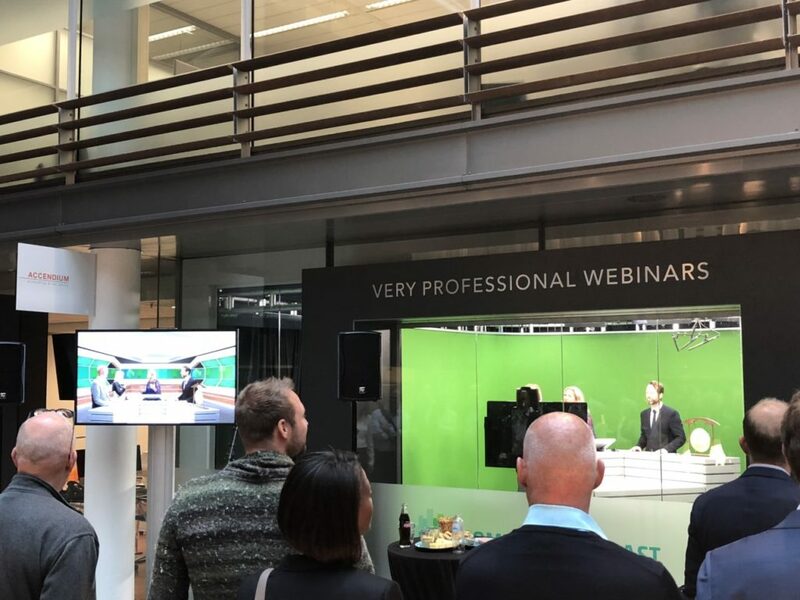 Our new webinar studio has moved to the central hall in the WTC Amsterdam and is equipped with the latest technology to broadcast on TV quality webinars. For this special occasion we have organized a short webinar. In this webinar Christiaan Huijs, Managing Director WTC Amsterdam explains how the arrival of the professional webinar studio of Company Webcast contributes to the demand for more sustainable entrepreneurship within the WTC. Sandra Gisler, Marketing Capability Manager at Heineken, will also speak. She talks about Heineken’s use of webinars and why she likes to come into the Company Webcast studio. And of course the studio is officially opened by the gong by Maurice van Tilburg, CEO Euronext Amsterdam. If you would like more information about the new webinar studio in Amsterdam or about the possibilities of using webinars? Please contact one of our webinars experts. You can always contact us for a guided tour through the studio.